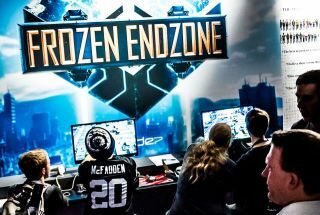 Frozen Endzone had its first public unveiling at London's Eurogamer Expo earlier this month. Exposing a game to the wider world is always stressful: not only did we have to cope with a barrage of unfettered opinion but also with managing the torrent of gamers, journalists, children and passive-aggressive bears (yes really) which threatened to swamp our humble creation. Luckily, it held up. From the very first day, people were sitting down with the game and, with a little bit of training, getting a lot out of it. After a brief hiatus involving both expo machines trying to log into the server as the same user, multiplayer worked brilliantly and attendees were able to challenge each other, beta testers and devs right on the show floor. Strategy games are perhaps among the worst things you could consider taking to an expo: they take a while to learn and play sessions tend to be long. However, just as with Synapse, Endzone matches can be pretty fast-paced, so people were able to get a satisfactory resolution for their efforts. One of the most useful things about shows is their ability to prove or disprove suspicions you've had for a while. We were considering launching our beta with a set of video tutorials, similar to the ones we used for the iPad version of Frozen Synapse, however watching our Level Designer Bin teaching new players we realised that a full interactive tutorial was really essential. Taking the decision to delay beta for a bit in order to get that done was difficult but also opened up the opportunity to address other issues. One piece of feedback we received consistently was that British gamers weren't sure about the game's theme, but as soon as they realised its heritage was closer to Speedball 2 than Madden, they immediately warmed to it. After playing for a little while, people also grasped that the gameplay was a significant refinement and evolution of Frozen Synapse, and that's when the excitement really started to kick in. We need to convey more that the game is based on a brutal future sport; we also need to show off the true depth in the gameplay. With that in mind, we'll be amping up the focus on violent crunching tackles and action on the visual side, while working on a way of showing off our eventual ideas about stats and team progression. Our vision for Endzone has always been about taking a core idea (a simultaneous turn-based future sport) and allowing people to play with it in any way they want. With that in mind, there will be modes which incorporate assigning points to different skills, like blocking and running, as well as more pared-down ones which have perfectly identical teams on balanced maps. We were really happy that the members of the press we met at the show picked up on all of the above. It's pretty difficult to both give someone the space they need to play a game and guide them through the idiosyncrasies of an alpha build at the same time, but we tried our best and it paid off. We feel like the tactical gameplay is doing its job; now it's time to work on polishing things up for beta.